We’re very happy to announce that Dynamics 365 for Operations – Warehousing has been made available on Windows Store and Google Play store. This app empowers warehouse workers in your organization to complete tasks in a warehouse by using mobile devices. It enables material handling, receiving, picking, putting, cycle counting, and production processes with your Dynamics 365 for Operations subscription. This blog post will take you through the prerequisites, how to navigate the app, and the options to configure the app in Dynamics 365 for Operations. The app is available on Android and Windows operating systems. To use this app, you must have one of the following supported operating systems installed on your devices. You must also have one of the following supported versions of Dynamics 365 for Operations. Use the information in the following table to evaluate if your hardware and software environment is ready to support the installation. For detailed steps on how to install and configure the app, refer to this tutorial: Install and configure Dynamics 365 for Operations – Warehousing. The app comes with a new user experience. In this section I will go through and show different pieces and elements that we have changed in the UI. Once the app is installed and configured to connect to a Dynamics 365 for Operations instance, you will be presented with a log-in screen. Sign in with the User ID and password of the warehouse worker. Learn how to manage warehouse workers with this tutorial: Manage warehouse workers. In the below image you can see the log-in experience, as well as the menu structure and navigation. For our most common flows that follow the same pattern of scanning input fields, we have changed the UI to split all information into two pages, the task or details page. In the task page, the information shown will be the main input field, three rows of additional information, and a previously scanned value. Sometimes there’s more information to any given screen than what can fit in three rows, and therefore we made the Details page, which will contain all overflowing information and input fields, as well as product picture in case that exists for the item. You can control in what order you want information to be prioritized to be shown on the Task page, this is done from the Warehouse app field priorities page in Dynamics 365 for Operations. This will be explained a bit further down in this blog post. The app comes with a custom numeric keypad, specially designed with rugged environments in mind. It has large buttons that are easy to touch, and a nifty calculator for those occasions where quantities needs to be converted on the fly. Alternatively, we have added a stepper for quantity input fields, where you can deduct or add to the quantity field without using the numeric keypad. This can be useful when it is not a high amount, and just a quick change is needed. If there’s multiple input fields in any given screen with values not seen before, the app will recognize this and display a different UI. If there is 3 or less input fields, a carousel will be shown, which will allow the warehouse worker to quickly switch between input fields, without leaving the task page. If there’s more than 3 input fields filled out and not seen before, a multi-input page with all input fields shown in a list will be displayed. The example below is during a movement of goods, where an existing license plate is scanned for movement, where the app receives information on what item, quantity, unit etc. that is on the license plate. It will then display that content with multiple input fields on the Task page, in order to enable the warehouse worker to quickly review, and move forward to the next step. As you might have noticed from the previous pictures, there’s not any buttons displayed on any of the screens except for the green OK button. We have deliberately moved all other buttons to an action pane, that is accessible from the hamburger menu in the top right corner. I will explain below the use of these pages, and how they relate to the app. In Operations you can configure how metadata should be shown on a warehouse mobile device on the Warehouse app field names page. In a new environment or company, you can select Create default setup to generate all field names that exist in any of the warehouse mobile device workflows, and assign them a default preferred input mode and input type. Preferred input mode – This option defines whether a scanning field or a manual entry input field should be shown for the selected field name. This is useful to distinguish fields depending on if barcodes are used for the field or not. Note: Field names with preferred input mode set to Scanning can still enter information manually in case the barcode is unreadable or damaged. Selection – The selection list is used for field names that contain a list of options to choose from. This option is not editable, and can only be change through extension. Date – Field names specified as date will show a date format with the label, to help warehouse workers know which format to enter the date in. This option is not editable, and can only be changed through extension. Alpha – If Alpha is selected, the device keyboard will be used when entering information manually in the app. The keyboard experience can change depending on the device used. Numeric – For field names that you know will use numeric input only, you can select this option to display a custom numeric keypad with the input field instead of the device keyboard. In the Warehouse app field priority page, it is possible to put field names into different priority groups. This makes it possible to decide what information should be promoted to the main task page when warehouse workers are performing work using the app. If you click Create default setup, a default set of priority groups will be generated. It is possible to create as many priority groups as needed, but only three priority groups will be shown on the task page of the app at any given time. When Operations is sending out metadata to the app, it will give each field a relative priority depending on its priority group, and the app will display the first three priority groups contained in the metadata on the task page of the app. The rest of the overflowing metadata will be presented on a secondary details page. 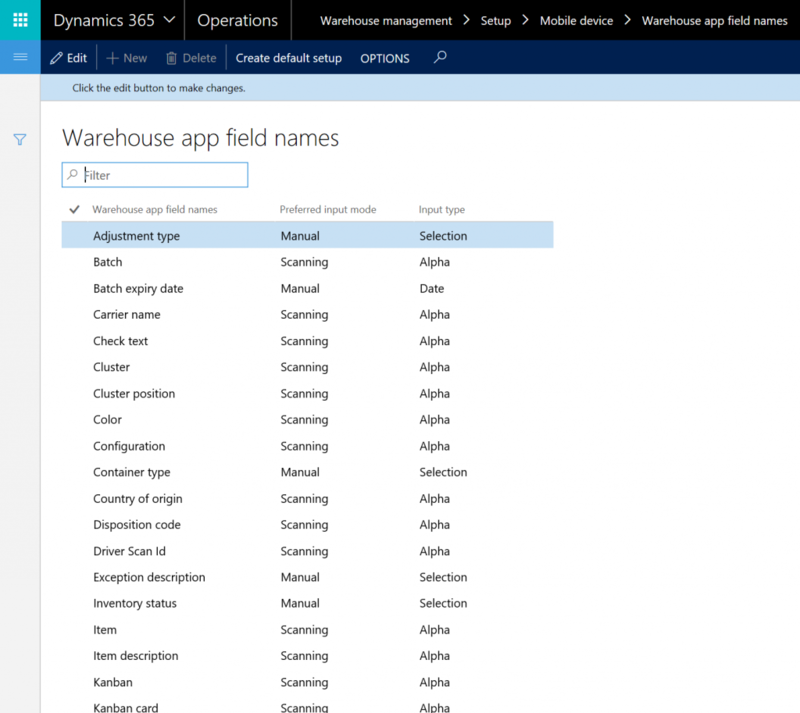 This blog post has provided a brief overview of Dynamics 365 for Operations – Warehousing. As always, we would appreciate any feedback you may have. We hope you enjoy using the app.